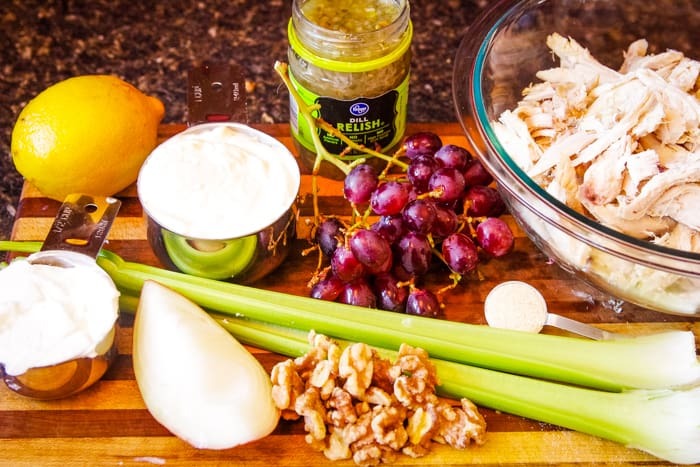 Easy chicken salad recipe with grapes is made with heart healthy celery and walnuts, a creamy yogurt sauce loaded with flavor and tender pieces of protein packed rotisserie chicken. 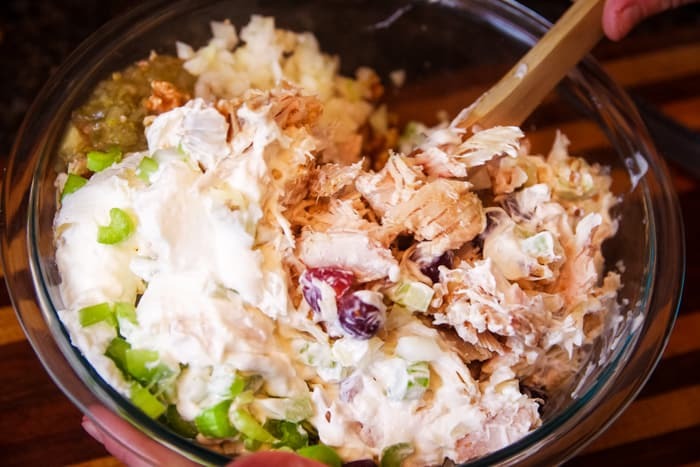 The snow may be falling up here in northwest Ohio, but my kitchen is warming up with delicious foods like this rotisserie chicken salad recipe I’m sharing today that remind me of spring. As a child, I went to a graduation party with my grandma and someone served amazing chicken salad sandwiches with rotisserie chicken, grapes and celery. I had never had chicken salad before, but it was unforgettable. 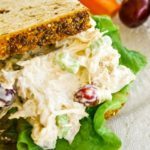 I thought all chicken salad tasted that amazing, but as I chased after more and more chicken salad sandwiches, I realized how special that recipe was. I only altered it a little to make it lighter for those of us who are making healthier choices in 2019. I don’t think you’ll be disappointed. When served with whole grain bread, this recipe contains all five food groups. Seriously, that is hard to find in a sandwich these days! 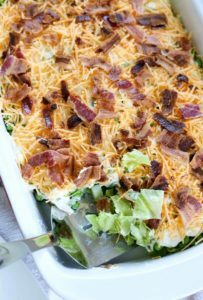 It has heart healthy celery and walnuts, a creamy yogurt sauce loaded with flavor and tender pieces of protein packed chicken. Surely, it will keep you going as you shovel the snow. Are you ready to make delicious healthy chicken salad with me? 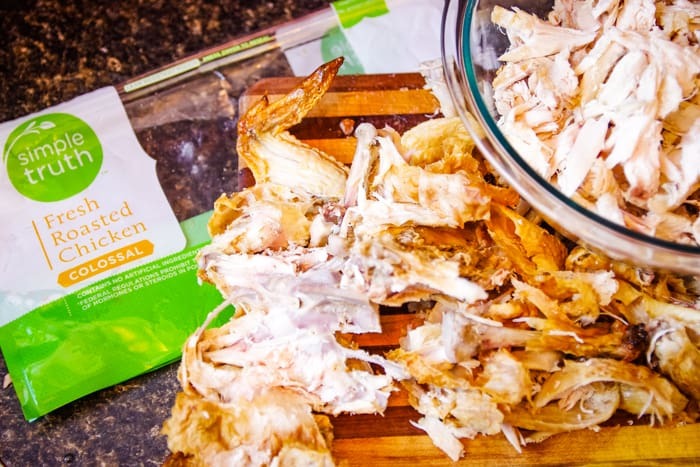 Step 1: Start out by buying the best rotisserie chicken you can find… or make your own! Our local Kroger serves chilled rotisserie chickens that work really well for salads. I love the mix of both white and dark meat. Pull off all the meat that you can (approx. four cups) and set it aside. Step 2: Gather your salad ingredients! Step 3: Mix it all together with the pulled chicken. If you plan to serve it over bread or rolls, you might want to add ¼ teaspoon more salt. If you serving it with whole grain salted crackers, it may be just right. Rotisserie chicken can have variations of saltiness so err on the lighter side and add more if needed. 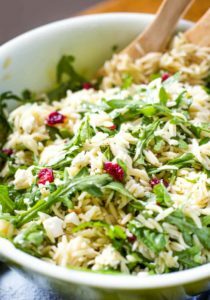 What spices are good in chicken salad? For this recipe you only need garlic powder, salt and pepper. How long does chicken salad last? 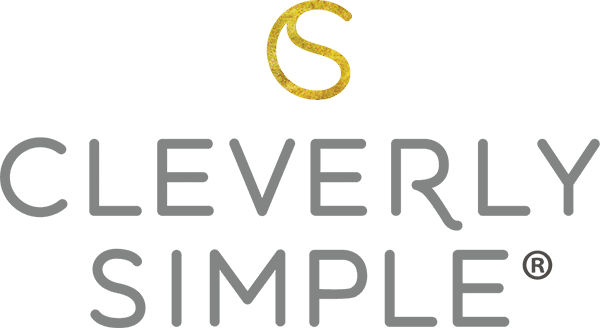 Store the leftovers in the refrigerator. Chicken salad will last 3 to 5 days in the refrigerator. 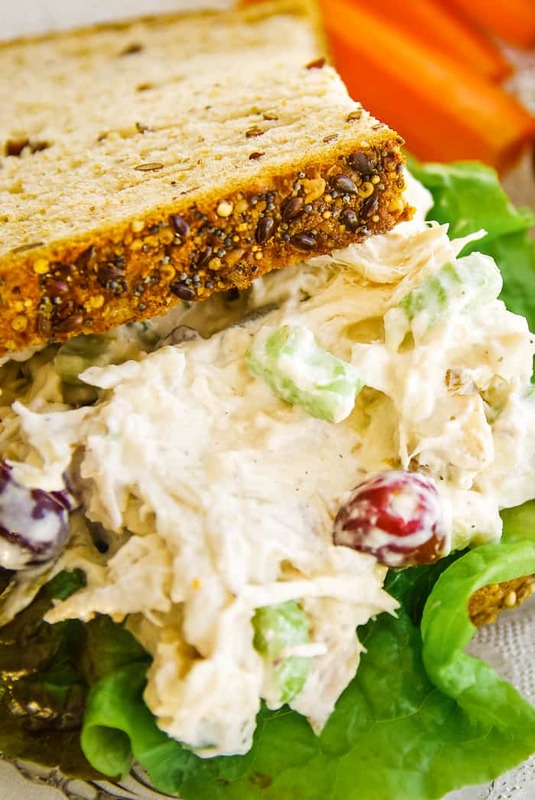 Can you freeze homemade chicken salad? The texture of the grapes and celery will change after freezing. The mayonnaise will also separate. So, while it’s “okay” to eat, chicken salad is best when fresh and not frozen. The search is over. Unforgettable healthy chicken salad to remind you of spring…and parties with loved ones. 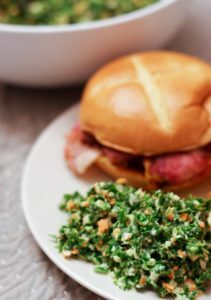 It’s the perfect lunchtime sandwich! 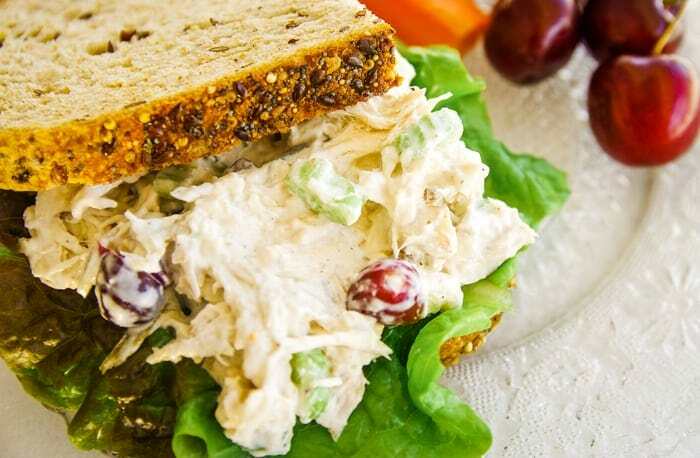 Easy chicken salad recipe made with grapes, celery and rotisserie chicken. 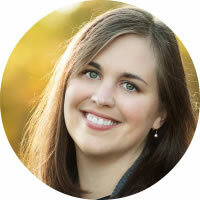 Pull off the white and dark meat from a rotisserie chicken (approx. four cups) and place into a large bowl. Add the remaining ingredients to the chicken and mix until well combined. Taste to see if you’d like more salt. Serve chilled in a sandwich or with crackers. 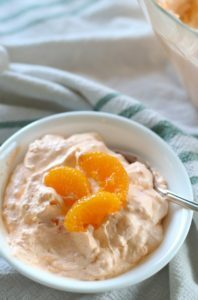 If you don’t want to use greek yogurt, you can substitute it with additional quality mayonnaise.